Welcome to the Cashiers Area Chamber of Commerce Member Portal. You've reached this page because you are interested in becoming an Associate Member of the Chamber. To apply and pay online, please fill out and submit the form below. You will be taken to PayPal where you may use a credit card to sign up. 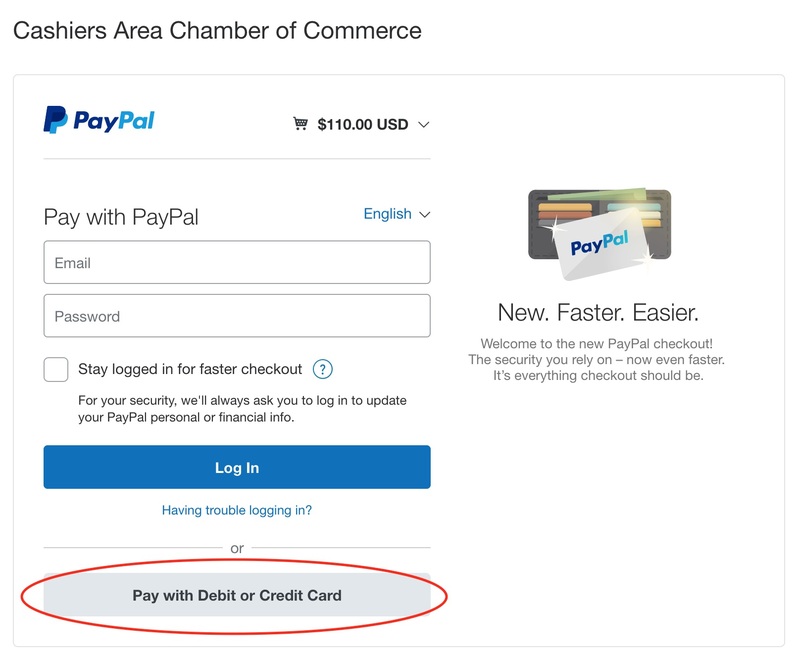 Please note that you do not have to have a PayPal account to pay by credit card. Simply look for the gray "Pay with Debit or Credit Card" button below the login fields and click it to be taken to a credit card screen. Click the screenshot shown here for reference. As an Associate Member (Individuals/Families), you will be invited to all Chamber activities and will receive exclusive Chamber communications, area promotions and community updates. It’s a great way to meet new friends and support responsible community development efforts while preserving the quality of life we all enjoy in the Cashiers Area. You may provide the contact information for a second person to be covered by your Associate Membership. This person will also receive Chamber notifications and invites to Chamber events. Please check that your email address is correct before continuing.